Ghent's Enclosed Conference Cabinet provides the perfect complement to any conference room setting. These sturdy units feature top-quality Mahogany or Oak texture laminate surface. 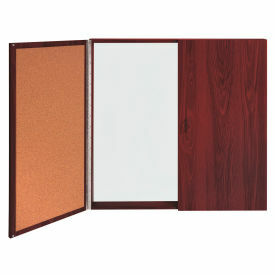 The cabinet opens to reveal an erasable porcelain magnetic whiteboard, with self-healing natural cork tackboards on the inside of each hinged door. Hinged doors feature magnetic door latches. Cabinet measures 48"x 48" closed and extends 5" from the wall. Interior depth of 3" allows for marker and eraser storage when closed. Cabinets are backed by Ghent's 10-year guarantee. Made in the USA.